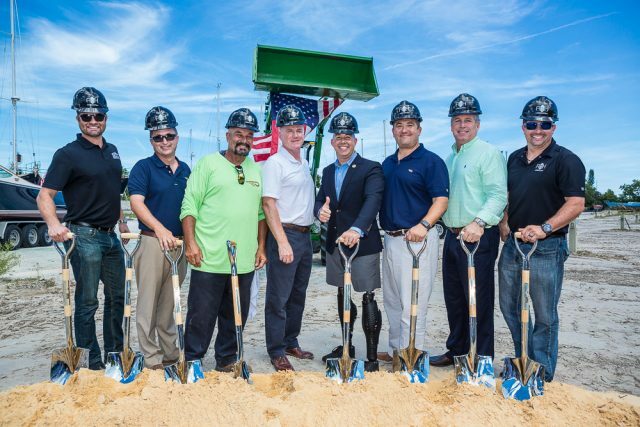 Stuart, FL (August 24, 2018) — Hinckley Yacht Services today broke ground on an ambitious 40,000 square foot climate-controlled storage facility at its flagship location in the southeastern US. The new facility is Hurricane rated to Broward and Dade counties’ standards for Category 5 storms. Upon completion, Hinckley Yacht Services will be the largest full-service yacht yard with climate-controlled storage in Stuart, a major hub for yacht services work on the east coast of Florida with a protected harbor on the St. Lucie River. “Providing excellent service to our customers has always been part of our DNA. We’ve been building and servicing America’s finest yachts for 90 years now. Increasingly we see the servicing aspect as a unique point of differentiation in the market.” said Peter O’Connell, Chief Executive Officer of The Hinckley Company. Hinckley is unique in having 8 yacht care centers up and down the east coast and affiliate partners on the west coast and in Europe. “We have found that our customers are looking for a trusted partner that can help them with service, refits, transport and storage” continued O’Connell. 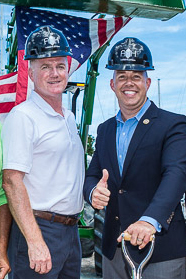 “Hinckley is excited to have the support and attendance of Congressman Brian Mast to launch important investments like this. This new facility is a strategic part of our service network and provides unparalleled customer service for our clients while creating additional skilled jobs in Stuart FL” O’Connell continued. Hinckley has two service centers in Florida, one in Stuart and one in Naples. The Hinckley Company purchased the David Lowe Boat Yard in Stuart in 2001 following its 47 years of longstanding service in the community. Hinckley’s reputation for service and yacht care has grown along with the ability to handle even the toughest projects such that many non-Hinckley yacht owners now rely on Hinckley Yacht Services for all of their service needs. “As Hinckley’s business has grown in Florida, more than half of our yacht care business now comes from customers who own yachts other than Hinckley’s, from sportfishers to outboard center consoles and large yacht refits” said Tim Shields, Vice President of Hinckley Yacht Services. This is a multimillion dollar investment and our largest in our Stuart yard to date. It is a result of the growth of our business in Florida and a desire to respond to customer requests for expanded service capacity, climate-controlled storage and storm protection” continued Shields.